Wednesday night we made homemade pizza. We were lucky enough to snag a sample of Chef Jason's (Vagabond Pizza) pizza sauce. He was making some for a large event and shared some of it with us. Armed with his sauce, freshly made pizza dough, fresh smoked mozzarella and tomatoes and herbs, we went to work. The great thing about making pizza is you are free to create what you want. If you want to use pizza sauce, go ahead. If you don't, don't. Making pizza is fun and creative. Many times, I do not use any sauce, just olive oil. If you want pizza sauce, you can make it, buy it, or be lucky enough to have a chef give you some. I crank our oven as high as it will go (550 degrees) and use either a pizza stone or a pizza pan. In some cases, if you are using ingredients that are more on the liquid side, you may want to cook your crust first for about 3-5 minutes and then take it out and add everything. Otherwise, it may get soggy on you. Spread out the dough. I do not use a rolling pin. I simply stretch the dough and toss it to get a round shape. This keeps the crust lighter and allows it to get crispy. Just keep working the dough into the shape you want. Once the dough is spread out, rub it with olive oil and add freshly cracked pepper and a little sea salt. If using pasta sauce, spread it now. If not, do not spread it now. I now add freshly chopped garlic. We like a lot of garlic, so I typically peel and finely chop 5-6 cloves. Now add the fresh tomatoes. For cherry and grape tomatoes, I slice them in half. For everything else, I slice them about 1/4" thick. Add freshly cracked pepper and sea salt to the tomatoes. Not a lot though. Add your fresh herbs. Our herb garden has Italian parsley, thyme, oregano and rosemary right now, basil coming soon. So, I use all four. I chop the parsley, oregano, thyme and rosemary together, pretty finely and then sprinkle it all over the pizza. Time to add the cheese....mmmmmm! I slice the cheese about 1/8" thick and shingle it on the pizza. Add as much or as little as you want. Drizzle the entire pizza with your favorite olive oil and gently add salt and pepper. Put it in the oven and let the magic happen. Watch and make sure it does not burn, but at 550 degrees, our pizzas are ready in about 5-10 minutes. When done remove it from the oven and let it rest for 2-3 minutes. Top with fresh grated Parmesan cheese, slice and serve. You can also add some fresh arugula to the pizza and put it back in the hot oven for about 2 minutes or until the arugula starts to wilt. Remove the pizza and drizzle on some Traditional Balsamic. Nice! As you can see, aside from not burning the pizza, there are not too many rules. Have fun and enjoy your creation. Invite your friends over and let them make their own. As always, if you do not want to make the pizza dough, we have fresh dough in the store. Ciao. If you are looking for something fun and different to do tonight, check out the Wylie Jazz Band concert at The Paramount Theatre. It starts at 7:30 and will be a great time. Joy and I attended the concert last year and really enjoyed it. I vowed last year to always go in the future. It is free and open to the public. This year's concert features guest artist Lenny Pickett. He is the current musical director and saxophonist for the Saturday Night Live band. Grab your significant other, go to dinner downtown and then head over to The Paramount Theatre for a great concert. You will be glad you did. We just wanted to pass along some information on a new catering business here in Abilene. Vagabond Pizza is owned an operated by Chef Jason Adams. Jason is a regular in our store and is very passionate about great food. He's a lot of fun and he's an Aggie. Whoop! If you are looking for something new and exciting to do at your next dinner party, corporate picnic or other event, give him a shout. Tell him cordell's sent you. 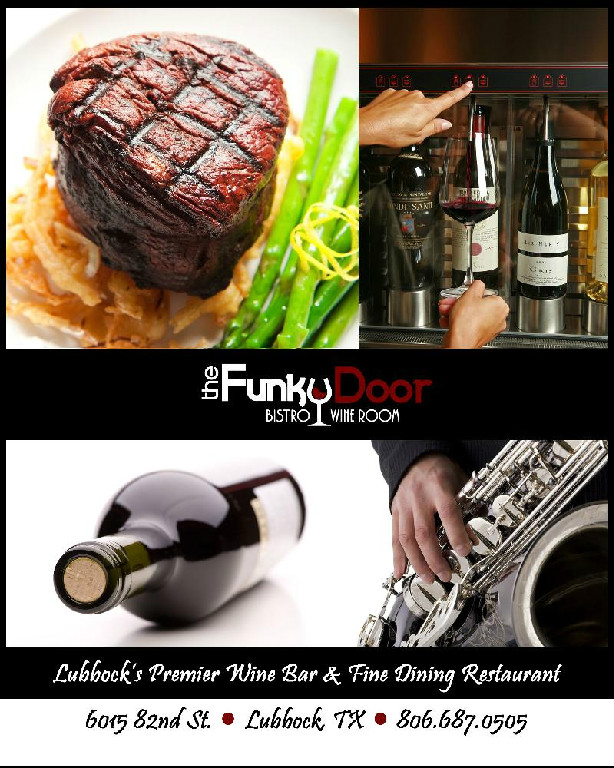 On your next visit to Lubbock, be sure and make reservations at The Funky Door. We were introduced to this restaurant by my cousin and her husband. The restaurant has a really cool laid back vibe and the hostess and waiters were extremely nice. We had a wonderful dinner that lasted a little over 3 hours. We were never rushed by our waiter and he insisted that we stay and enjoy ourselves as we had the table the rest of the night. If you are looking for a cool wine and dinner experience, check them out. It will be a great time. 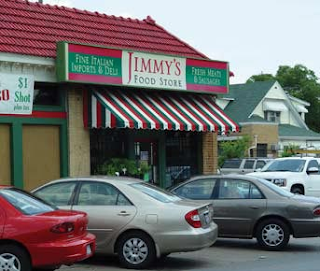 The next time you are in Dallas, be sure to go and check out Jimmy's Food Store. We visited last June and it was wonderful. Their selection of Italian foods and wines is awesome. So, if you are looking for something new and different to do while in Dallas, be sure and check them out. 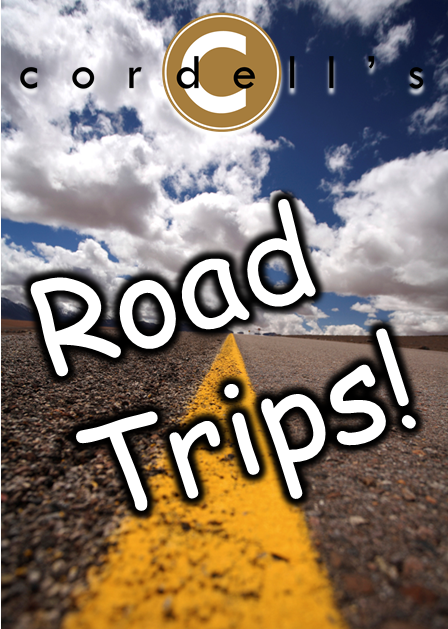 We think you will have a great time. Last night we had a wonderful opportunity to speak to a women's group from First Christian Church in Abilene. We discussed the history of olive oil and balsamic vinegar, how they are made, their health properties, and how to recognize a quality olive oil and balsamic. We also had an opportunity to share our story. It was a great evening and everyone was so nice and welcoming. We had a ton of fun, and are so glad they asked us to come and share with them. It was a tremendous blessing. They provided us with dinner before we spoke and it was wonderful. They used cordell's oils and vinegars and everything was super tasty. Thank you ladies, for a great evening. After we finished speaking, we drove around downtown to look at all the beautiful churches and restored houses. We realized that it had been a couple of years since we had nosed around all of downtown, not just Cypress and Pine. One of the buildings that really caught our eye is the offices of The Tittle Luther Partnership. The restoration of this old house is gorgeous. They have done a wonderful job and the grounds and buildings are very calming and serene. As we were driving around, we found ourselves near the Beehive, and I decided we should go in and eat. It had been over year since we last ate at the Beehive, and last night was a great night to eat there again. The service was wonderful and the food was excellent. We both had a filet and they were cooked perfectly, medium rare for me and medium for Joy. Last night was a wonderful evening. 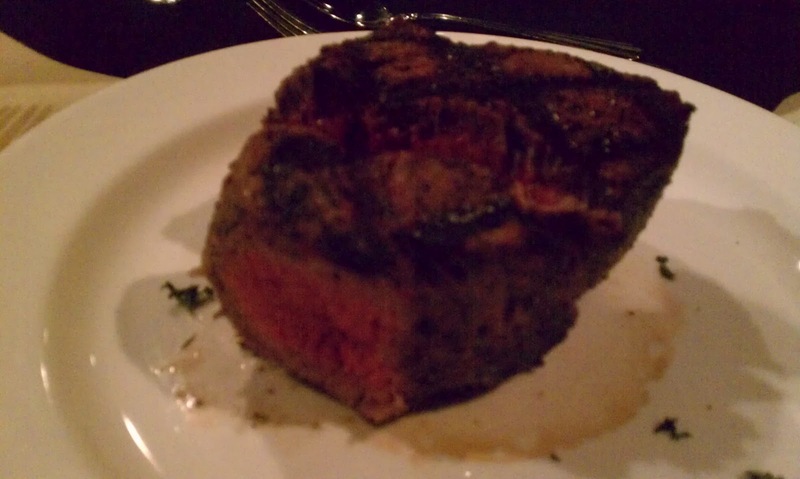 A great class topped off with a great steak. Who could ask for anything more? We added more plants to the garden last night. We originally started our winter and spring gardens from seed, but decided to add some more plants to the ones that have already sprouted. If all goes well, we hope to be harvesting produce starting next month and lasting until early November for the spring/summer plants. Our raised beds make gardening super easy. I built our garden out of 2x12s about three years ago. Our previous garden was built out of 2x6s and top soil in 2005. I originally used 2x6s to build the garden so that I could test out my ideas. After a few years, we knew what we liked and what we didn't. I could have rebuilt it out of 2x6s and it would have worked just fine, but I wanted to add a decorative touch to the garden as well, so I used 2x12s. The trellises for climbing plants are made with 1/2" PVC (with rebar inside) and nylon netting. Aside from needing a fresh coat of paint, it is working really well and has held up to the elements. The bottom of the beds were lined with paper sacks from our local grocery store and filled with compost. I do not have any top soil in the beds, just purchased compost and compost that I have made with my home-made worm composting bin. (That is another post.) I do add composted cow manure or composted chicken manure or other organic compost annually, each February. When our plants have sprouted, we begin adding mulch. We place a 1-2 inch layer of mulch in each bed. The following year, I will turn that mulch into the bed when I add the new compost and allow it to continue to decay and feed my plants. It took some blood, sweat and tears to get the garden built and functioning the way we want it, but gardening now is so much easier. No plowing, hoeing, row building or weeding. The compost is easy to dig in and does not require any special tools. I will do raised bed gardening from now on. We've liked it so much that two years ago I built an herb bed right off our back patio. I used 2x12s again and made it 2 feet wide and 8 feet long. It faces east and south and is protected by the house on the other two sides. If you would like to build your own raised bed garden, it is very easy. I suggest starting small and then expanding as necessary. You can use 2x6s or larger. The basic steps are below. I am also including a link to Square Foot Gardening. I found Mel after I originally built my first garden. I read his book and he covers many of the things we learned through trial and error. Here are the basic steps to build your own garden. Cut your lumber into lengths of four feet, you will need four pieces. Assemble your four pieces into a square. I recommend attaching them together with 3 inch screws. At least 2 screws per joint. Place the newly built square in your sunny spot. No need to remove grass or other vegetation, just make sure it is mowed down. Line the bottom of your square with paper bags or newspapers (one layer of bags should be enough). You can also use flat cardboard. Fill your square with compost or potting soil. Plant your plants and water them in. I will provide some photos of our garden in a later post. However, Mel's site has some great photos illustrating how to build your garden. If you have any questions or ideas you would like to share, please drop us a line or stop by the store or post them in the comments below. We are continuing to learn as we go and we are always open to new ideas. We love us some pot roast! And with this simple recipe, you can enjoy it any time! Joy found this recipe years ago on the world wide web and it has been our go-to pot roast since. In the immortal words of Ron Popeil, "set it and forget it"! 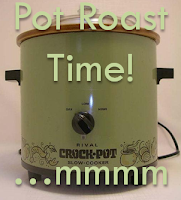 Place the roast in the Crock-Pot. I start mine the night before. Stir together the water and all three packets. Pour the mixture over the roast. Turn the roast and make sure it is coated. Turn the Crock-Pot to low and let it go. If you start the night before, check it first thing in the morning (you may need to turn the roast). Plus, I sometimes add baby carrots and potatoes the next morning. Let it cook the rest of the day, and when you are ready to eat, remove the roast, carrots and potatoes. Spoon the juice from the Crock-Pot over the roast, carrots and potatoes when serving. Feel free to thicken the juice in a sauce pan before serving. If you do not add potatoes to the roast, this roast is excellent served on whipped garlic potatoes. So go ahead, get your pot roast on. You will not be disappointed! 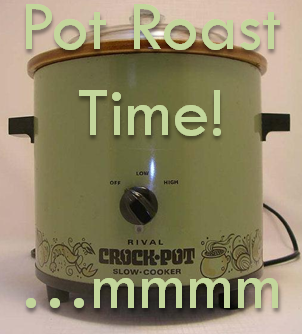 **The Crock-Pot pictured above is the same model that we use at home. It was given to us by my grandmother. It is older than me and still going strong. Have you ever wanted to substitute olive oil for butter but did not know the conversion. Well, here is a handy conversion chart. Enjoy! I will actually be making this dish for dinner to go with a pot roast that has been cooking all night. 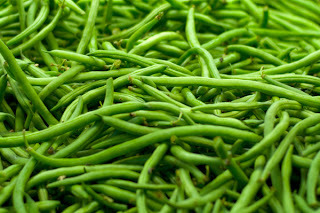 By cooking the green beans this way, they still have that fresh bite to them. In a skillet or saute` pan with a lid, heat the olive oil over medium heat. When the oil is heated, toss in the garlic and cook until it starts to brown. Do not let it burn. Toss in the tomatoes and toss to coat. If you do not have cherry tomatoes, use plum or grape. You can also use Roma or other medium-sized tomatoes, just slice them about 1/4 inch thick. Season with salt and allow the tomatoes to cook 5-7 minutes. At this point, you can throw in some red pepper flakes or you could use Chipotle or Harissa Olive Oil in the beginning to bring some heat. Toss it to combine. Throw in the green beans, toss to combine and put on the lid. Allow everything to cook another 8-10 minutes. The lid helps steam the green beans. After 8-10 minutes, remove the lid, the green beans should be done, but still have a fresh bite to them. Season with a little more salt and some pepper. Toss everything together and make sure the green beans are coated. Serve and enjoy!! Some days you are crunched for time and may think that you do not have time to make a home-cooked meal. That is where this recipe saves the day. We have used this one (or a variation) many times, including last night. It packs great flavor and freshness and can be completed in the time it takes dry pasta to cook. Feel free to modify or adapt it to your own tastes or available ingredients. Food should be fun, enjoy it! Cook the pasta according to package instructions. However, add two garlic cloves to the water as it is heating to a boil. Be sure and add salt to the boiling water before adding the pasta. In a bowl big enough to hold the cooked pasta, add the lemon juice, lemon zest, olive oil, 1/2 the parsley, scallions (if using), salt and pepper. Whisk it all together and wait for the pasta. When the pasta is done, drain it and reserve 1/4 cup of the water. Add the pasta to the bowl and toss to coat. Season with more pepper, top with the parmesan, remaining parsley and pine nuts (if using them). Plate it up and eat. Enjoy! You can also add a quick salad. We added one last night and were lucky enough to use fresh salad greens from our garden. We will also use a Spring Mix from the grocery store. In a bowl, add salad greens, thinly sliced apple, halved grapes, chopped scallions and chopped parsley. Drizzle on Persian Lime Olive Oil and Traditional Balsamic. Toss to coat. Top with more parsley, scallions, toasted nuts and grated parmesan cheese. Drizzle on a little more olive oil and balsamic, and add some freshly cracked pepper. Both of these dishes can be prepared in about 15 minutes. Since Monday is our day off, we decided to take a little road trip to get out of town and to see the wildflowers. So, we headed south to Brownwood. The recent rains in February and March have really made a difference. Pastures are greener than they have been in a while, there was water in the creeks and tanks, and the wildflowers were beautiful. 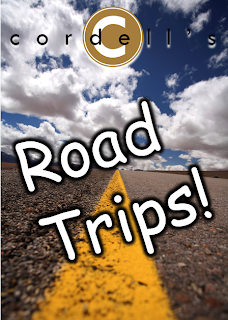 It was a lovely drive to Brownwood via Highway 84. Once we arrived in Brownwood, we went looking for a little restaurant we had been told about. We found it on 110 East Chandler Street. The place we were looking for was Steve's Market and Deli. We went in and had a nice lunch. They were very nice and very busy. For the price, you get a lot of food. You get a sandwich, chips and a bowl of soup. We left full and satisfied. After lunch, we continued on to Comanche just for the fun of it. We drove around the square and looked at all the lovely shops and restored buildings. We made a note to return on a day when Brennan Vineyards is open. We left Comanche and headed to Rising Star. We stopped off at the Hardwick Nursery. We really enjoy this nursery, located right on Highway 36. We have stopped here before in the fall for pumpkins and other gourds for decorations. Their nursery was in full bloom and looked like a gardener's paradise. The owners were really nice, and helped us find a rose bush that we have been trying to find for the last two years. After we left Rising Star, we made our way back to Abilene. We covered almost 200 miles round trip, but it was a great day.